The box of ginseng tea that I bought is packed with 30 small packets. Each packet weighs 3 grams. 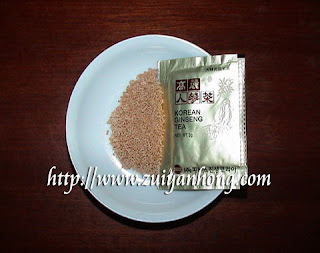 The ginseng tea in the packet is in the form of small particles. It can be served as a daily beverage that nourishes our bodies. Ginseng tea also helps us in recovering of physical energy after a hard day work. Ginseng tea is one of my favourite drinks. If only it can be made more affordable, then I'll be able to drink more of it! You can sign up with this url : make money now! hi, do you know where we can get the korean ginseng tea (preferably in teabags form) in kl? my email is : alexandryalow@yahoo.com. thanks..